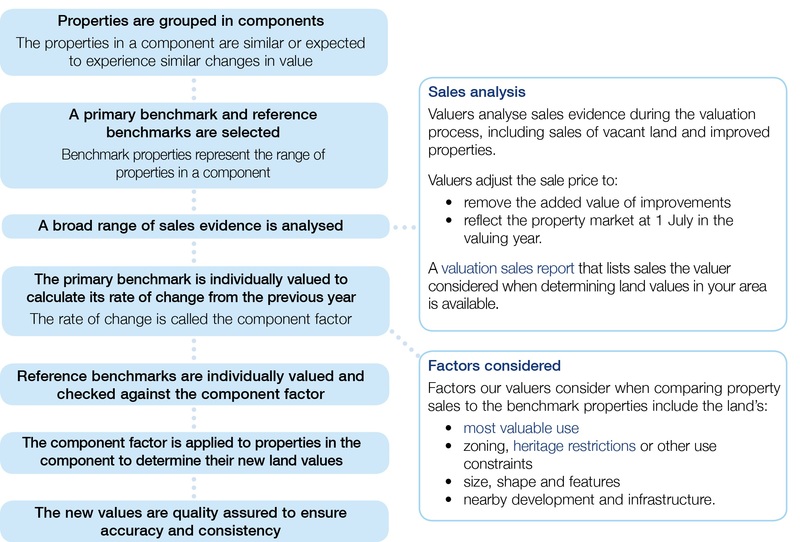 Detailed information on how different property land types in NSW are valued can be found in the Valuer General's valuation policies. The policies set out the methods that valuers use to value specific types of land and when those methods are applied. Land value is the value of your land only. It does not include the value of your home or other structures and improvements. Land values in New South Wales are determined at 1 July each year in line with the Valuation of Land Act 1916. Most land in NSW is valued using a mass valuation approach. Any concessions and/or allowances applying to your land under the Valuation of Land Act 1916 will be printed on your Notice of Valuation or land tax assessment. The legal effect of encumbrances such as easements, rights of way, title covenants, caveats and 'restrictions to user' are not considered when determining land values. Only the physical effect of encumbrances can be considered in the valuation and land value review process. Your personal circumstances, council rates and land tax liability are not considered when determining land value. Further information on how we value rural land, strata sites and irrigation properties is available.